Vendors You Should Know – Kristin – Our DJ Rocks! Dear ladies and gents, get ready to meet one of the coolest and badass DJs in the Central Florida wedding industry! This is Kristin of Our DJ Rocks. She is the founder and Senior DJ/MC of this incredible business. I got to meet and work with Kristin and Gaby (and their signature sparkly Toms) at Leah and Greg’s wedding at the Lake Mary Events Center last weekend. I was SO excited to spend the reception with two fun, energetic female DJs (such bossbabes!). I was so impressed when Kristin got every. single. guest. out on the dance floor during the beginning of the reception. The guests were dancing all night! If you are engaged or have any need for a DJ/MC in the future, read on for some super helpful advice from this passionate wedding vendor. If you had 1 minute to tell a new friend about your business, what would you say? It’s tough to put into words what our team is like, but here goes. We are uber-organized, easy to work with and like a brief-case-on-a-rope-swing, professional-yet-fun. Our team is extremely positive, always smilng and tend to add to the energy and excitement for your celebration. We have a no chicken dance policy. 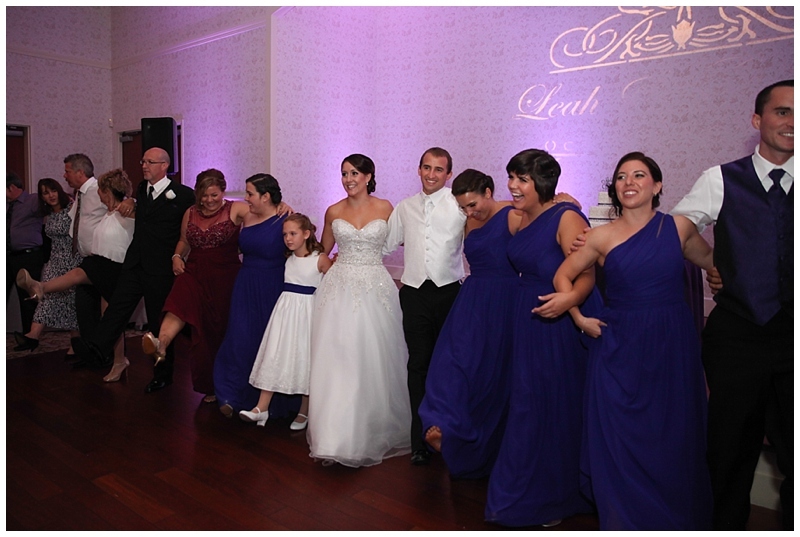 We have a passion for weddings and we love “love”, especially when you can see it shining from a dance floor. Tell us about your background that led to you starting your business. True love, friendship, loyalty, commitment, celebration. Those are the reasons I started this business. Music is a powerful tool that sparks emotion. It brings back memories and creates new ones. I know that at any given moment during a reception, if I play the right song at the right time, magic happens. It gets Grandma on the dance floor. It makes you and all of your closest friends laugh from thinking about the middle school and high school days. It makes mom and dad happy. 50 years from now, there will be a soundtrack and moments that you will replay over and over again. I want your day to be a meaningful celebration because the best moments…. are simply unplanned. Where are you located? Do you travel for weddings? We’re based out of Central Florida and do travel. What makes your DJ experience unique and special? It’s definitely our passion and our beliefs. We believe that music has a power that is beyond our control. We know that we were meant to celebrate love and milestones through music. We live for unplanned moments. What are your go-to songs for getting people on the dance floor? It truly all depends on our couples taste. Once we know that, then I can answer that question. For example if you’re a country fan, Friends in Low Places is always a go to or even copperhead road! If you’re a classic, like to hang at bars kinda couple, Don’t Stop Believin’ by Journey is DEF a staple. If you’re into throwbacks, then Backstreet Boys or Spice Girls might be your flavor. If you’re a love of EDM you probably like anything remixed by Kygo, Tiesto or David Guetta. If you like to make your knees touch your elbows, then maybe a little Ying Yang Twins will get you dancing. We actually have an online planning system that picks your brain like crazy to get to know what music you like and don’t like. Our couples can be as involved or as hands off as they what to be with this process. Some of our couples like to be more involved and customize their music while others like to give us their favorites and say run with it! What are some helpful tips you can give to engaged couples regarding reception music? As long as you have an idea of your reception vibe, pick a DJ you can trust. Do you want your reception to be high energy all night long or do you envision you and your friends hanging out by the bar jamming to sing along songs? Sometimes how you picture your reception can tell you everything you need to know about the music. Have you seen any creatively awesome couples surprise their guests during the first dance? OMG YES! So I had a couple once that wasn’t too into being the center of attention, AT ALL. SO, while their guests started filtering in from cocktail hour to the reception, they were already on the dance floor doing their first dance. For about the first 30 seconds to a minute, it was just the two of them sharing in those moments. It was beautiful to watch the guests be mesmerized as they started taking their seats. As they finished up their first dance, we announced the new Mr and Mrs. So we were able to use that as a transition rather than a huge formal introduction. 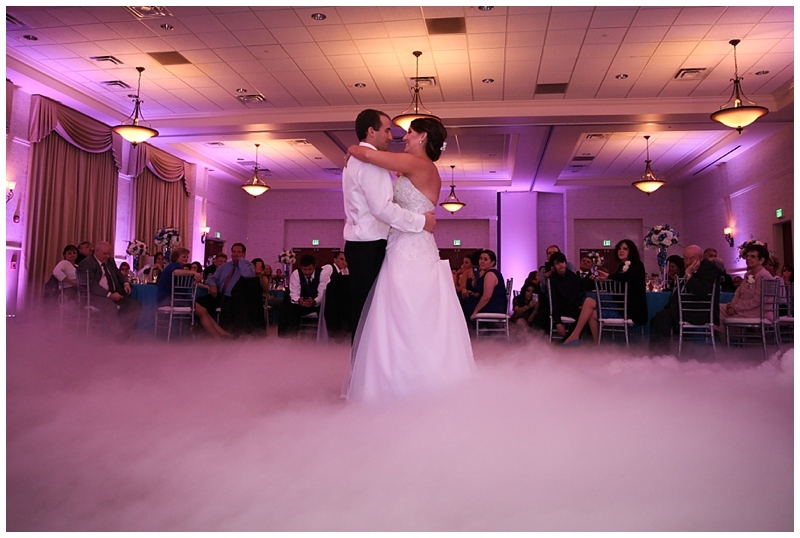 We’ve also done more dramatic first dances, like the dancing on a cloud effect. I love being able to find out more about my couples, because then I can make recommendations or throw out ideas of how to bring it to life. Tell us about one of the most heartfelt wedding moments you’ve experienced. Colleen’s dad had just gone through heart surgery and was on medication. It took every inch of his being to attend the wedding, let alone stand up. He forgotten his heart medication and just didn’t know how much longer he could be there without lying down. After about 3 people trying to convince him not to, Colleen’s Dad made the decision that he was not going to be able to have his father/daughter dance with his daughter. While the groom was dancing with his mom, Colleen left the room so heartbroken – as was I. I could not stand to see her like this, so I politely went over to Dad and had a quick heart to heart. I let him know that I knew how he feels. My dad/uncle had been on crutches since he was 15 and only had one good leg. So for our father/daughter dance together, we stood on the corner of the dance floor, he dropped his crutches — and we just rocked back and forth. Our feet didn’t move an inch… we just stood there, swayed back and forth for about a minute. It was a short lived minute, but it was one of the most memorable moments of my life. After telling him that story, I asked him to make a deal with me: If I only played 60 seconds of the song, could he just stand there at the edge of the dance floor and just sway with his daughter. He simply looked me in the eyes and said, “I will do that for my daughter, Thank You.” You should have seen the look on Colleen’s face when she walked in the room and I told her it was time for the father/daughter dance. Needless to say — I am completely in <3 with this photo, including one tear drop on her cheek. It will continue to bring tears to my eyes every time I see it. I truly believe that you must have a love for weddings. 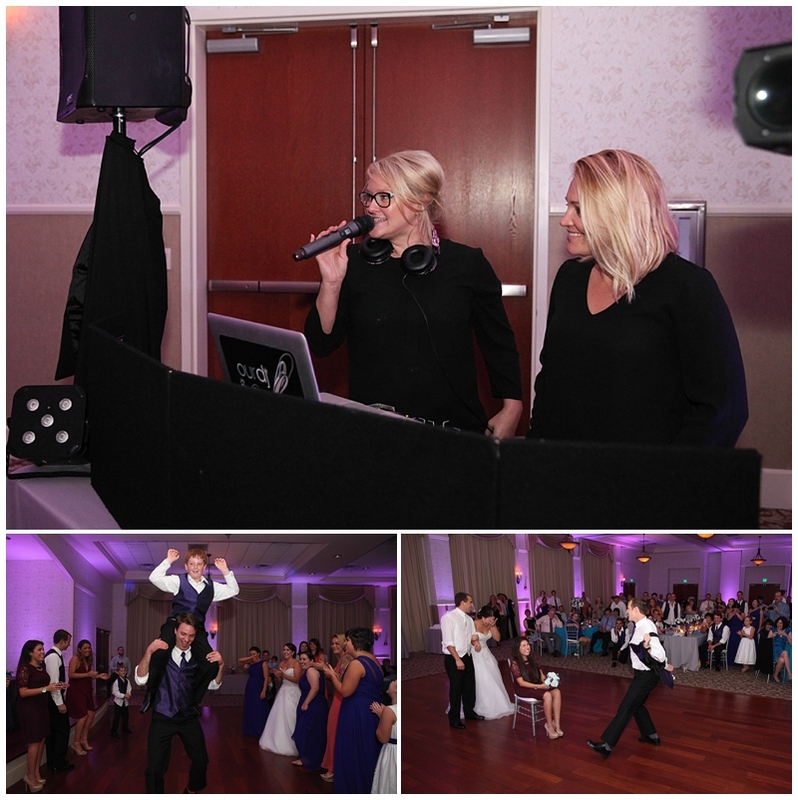 That mixed with a passion for music makes for the perfect ingredients for a wedding DJ/MC. What were some of your favorite memories from your own wedding? Thank you, Kristin, for sharing your wisdom and helpful tips. I hope I get to work with you again soon! Thank you for featuring us! Woohoo! If I needed a DJ I would hire Kristin!